Portrait of Patrick Burk, Bugatti’s first employee in its modern era. His greatest treasure is a sheet of writing paper without any writing on it, with an embossed Bugatti emblem and two black lines in the top left-hand corner. Ettore Bugatti had this writing paper made in 1939 following the death of his son Jean as a sign of his grief,” says Patrick Burk. He was given the sheet of paper many years ago by a long-standing employee of Ettore Bugatti – out of gratitude for his untiring dedication to the French luxury manufacturer. Patrick has been the facility manager with Bugatti in Molsheim since 2001, which makes him Bugatti’s longest-serving employee. Over the course of time, Burk has delved deep into the history of the historic French company. Not because he had to, but because he finds the family so fascinating. The 57-year-old Frenchman is the only employee to live at the facility. His home is behind the proud Château and the Remise Nord and he takes care of the facility seven days a week. This is his dream job. It was only by accident that Burk, who trained as an industrial mechanic, technician and engineering assistant, came to his current job. “I saw a job as a caretaker advertised in newspaper. The advertisement did not state the name of the company or the precise location. I became curious and decided to apply, says Burk, who was born in Strasbourg. He was invited to an interview at the Château, which had just been restored. “During the interview, I was asked about my qualifications in the areas of plumbing, electrical systems, gardening and security. It was only at the end of the interview that the personnel department member told me that the new headquarters of Bugatti were to be built here at this historic location. I was thrilled that Bugatti was returning to its home in Alsace,” says Burk. At home, he obtained all the information he could about the Bugatti family. “Afterwards, I knew that I really wanted this job. Bugatti is a brand that is inspiring and creative, artistic and technically highly demanding. It is also a French brand,” says Burk. The founder of the brand, Ettore Bugatti, moved to Molsheim in Alsace in 1909 and sold his first Bugatti vehicle a year later. For Ettore Bugatti, who was born in Italy, Molsheim became his workplace and his home. As it soon did for Burk. There were two more interviews within the space of about six months and he finally won the job against more than 300 competitors. “However, I did not know what I was letting myself in for. At that time only the Château had been completed, but it was not clear how the company would grow,” Burk reports. His precise title is “Facility Manager. He is much more than just a caretaker. For the first four years, he was responsible for security around the newly built ancillary buildings. The facility has an area of 23 ha with five buildings. He also takes care of exotic plants such as citrus fruits and palms in the “orangerie” as well as the deer that roam the grounds. The 57-year-old starts his rounds at 7 o’clock every morning. He inspects buildings, boilers, and ventilation systems as well as welcoming people as they come to work. “After 18 years, I am really familiar with the plant and I notice any irregularities immediately,” he comments. Any problems are solved immediately. If necessary, he commissions craftsmen to carry out major work. “It is important to keep the facility with all its buildings in very good condition, near to perfection. The factory should be just as good as our vehicles,” he adds. And he is always very near to the vehicles themselves. His office is in the Atelier, where the Chiron1 and Divo2 are produced in weeks of painstaking manual work. Within the Volkswagen Group Patrick Burk is rather an exotic employee. While other facility managers have to deal with huge production plants and robots, he is more of an estate manager. With considerable attention to detail, he inspects historic buildings, flora and fauna. Some of the oaks in the woods are almost 250 years old. 14 fallow deer live between the trees in a four-hectare park. Burk, who trained as a paramedic and a fireman is also responsible for occupational health and safety and fire protection. He says that he is mainly self-taught: “I have a wide variety of interests and enjoy learning something new every day. Such as how to deal with the deer and the trees. When I am doing my morning rounds, I’m really pleased to see the woods and the animals. It is always a new experience,” he says. In his opinion, this may be difficult for ordinary employees to understand: “but I would do anything for Bugatti. I helped to build up this plant and it is a large part of my life,” he says with deep conviction, despite the fact that is the father of three children and already has three grandchildren. As Bugatti’s first employee, he is not only thoroughly conversant with the history of the location and the family but also knows all the employees and some of the customers. “New colleagues often ask me how things used to be here. I then tell them how I started on a green field,” he says. He also has good contacts to long-standing customers. This is rather unusual for a caretaker, but not for Burk: “In the early days, I collected customers from the airport, showed them the site and explained things to them. I made many friends in the process,” he reports. Regularly, Burk, who is a car fan, climbs into a Bugatti Chiron for a short trip with local authorities such as police or the fire brigade, so that they can see what works of art are being created in their neighbourhood. “Otherwise, it’s difficult to explain what is so special about Bugatti – the beauty, the quality and the performance. It’s just the best car in the world,” he says. 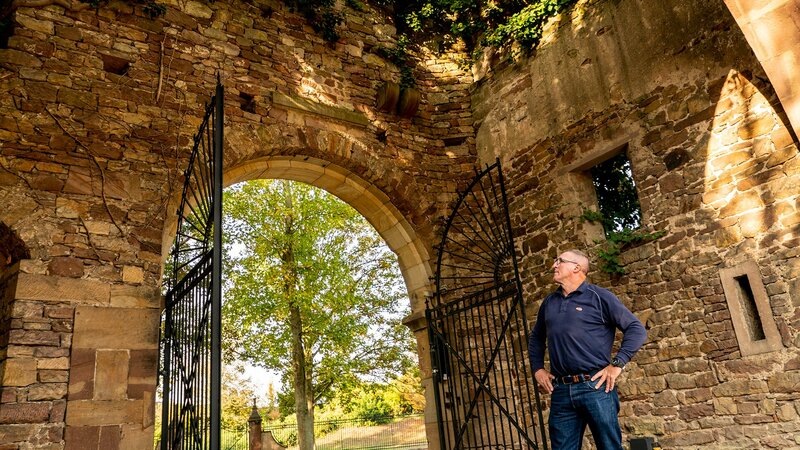 Patrick Burk relaxes in a very special place: sitting under the 13th century archway and looking towards the Château, he enjoys the view and the calm. He still finds it hard to believe that this is his job here. But he always has his smartphone with him. After all, something could happen at his company. 2 Fuel consumption, this model is not subject to Directive 1999/94/EC, as type approval has not yet been granted.